Nice one Jake. Will you be doing any further sheets for other units and camouflage schemes? Yes. There are plenty of others I'd like to do, from Vietnam up through the ANG. 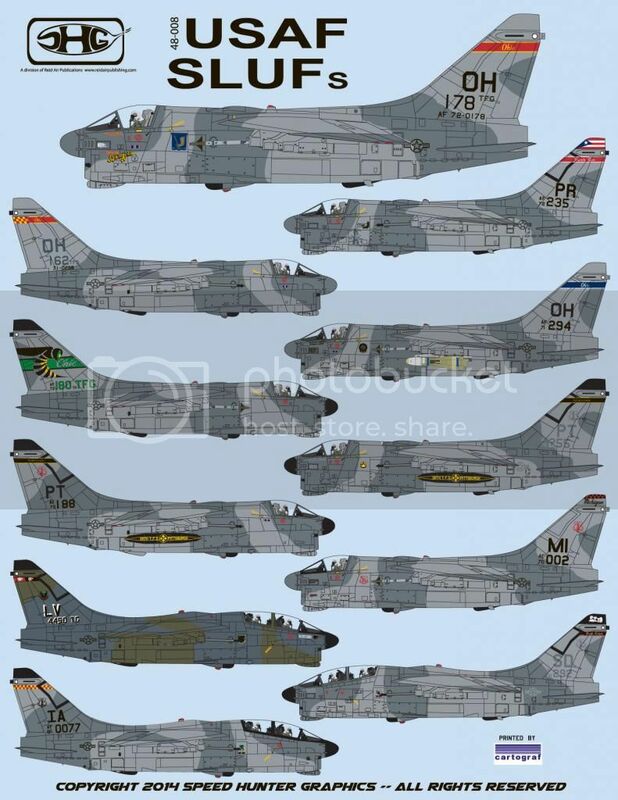 The SD A-7K was actually my plan when building Hobbyboss' A-7C into an A-7K, however the xtradecals available at the time got the colors all wrong. That made me make my A-7K into Pensylvania 146FW. You guys are preaching to the choir. I really like the Ohio jets and would love to do 'City of Springfield' in 1/32. Once my current 32nd stuff pays for themselves, I'll consider doing more in that scale. It may be a while still, though. Ok so yet more decals to order. My God when will it end my wallet can't stand it . Now if I can figure out how to graft the front end of the Hasegawa kit onto the crappy HB kit to do that 2 seater all will be right with the world. Too bad HB had to use so much of the Trumpeter kit when they scaled down. Been waiting eons for a decent A or B model A-7. Hope lives eternal I guess. Good grief! The days are just crawling until pay day, when I can order these! I've had two hasegawa Ds fully loaded with goods just waiting on some good 178th markings!! Ha! That's a good point... practice build on the Iowa jet so I can ensure a quality build on the Ohio. Good thinking!! I just ordered them this morning. W I N- I've been wanting to do an IA jet for a long time. what about doing some virginia slufs, they had a lot of cool artwork on them. I have the Virginia jets ready for the next SLUF round. Geoff Martin was nice enough to send over a bunch of nice references for them.